Ryan Barnes has demonstrated a sketchup video that will provide some useful tips to generate a tessellation piece through sketchup. This tessellation model can applied for laser cutting in future. In order to create this, first install sketchup as well as default template (3d printing-inches). Go to template inside sketchup make 2015 and select 3d printing – inches. Victor Ruiz presents a nice video tutorial for sketchup users which show how to apply sketchup v-ray for creating stunning rendering concerning presentation in HD 6. Sketchup to GCode plugin is used to directly export GCode within sketchup. This sketchup plugin is based on open source under GPLv3. The GCode plugin is ideal for laser cutters and estimating & adjusting the laser beam width. Besides, the can also slit the holes in faces precede the outer edges for better perfection. It is a .zip file of the plugin .rbz file and a test pattern. In order install the plugin, just extract the file in initially, then open SketchUp, click SketchUp->Preferences->Extensions, click Install Extension, then locate the nb_skptolaser.rbz file. Disney has introduced an augmented reality coloring book App that can be used to map color in real-time out of a 2D coloring book onto a animated 3D model. The users can give color to any character in a printed coloring book and review their work via a mobile gadget. The users can view the colored character go around in augment reality 3d space on top of the page. The sketch is recognized and addressed, and the video stream is augmented through an animated 3-D version of the character that is textured based on the given color. There is a texturing method that uses the captured texture out of a 2-D colored drawing to both the seeable and occluded regions concerning a 3-D character in real time. There exist a deformable surface tracking system intended for colored drawings that applies a new outlier rejection algorithm for real-time tracking and surface deformation restoration. The 2d and 3d content can be generated through a content creation pipeline. Every single character in the coloring book is generated in 3D modeling software and animated. Afterward, every surface pixel on the model is attributed a equivalent pixel space on the 2D image in the coloring book. CGworld Pte Ltd is offering an exclusive online course for v-ray users. The course is known as 5-Step Render Workflow. By undergoing this v-ray course one will be able to use v-ray as a real DSLR camera. One can learn to use photographic perception to V-ray. With 5-step render workflow, one can learn realistic composition, professional lighting through v-ray, material formation in v-ray, final setting and render elements with v-ray, post production methods with photoshop. All the lessons in this v-ray course are provided with v-ray for 3ds max which consist of videos, concepts and exercises to allow to be a 5SRW certified professional for v-ray. This course is available in 7 different languages. The course contains 50 advanced prerecorded lessons. Besides, some renowned v-ray official instructors will provide their support directly through email. If you are not 3ds max user, there will be series of downlodable files scenes for 3ds Max, Rhino, SketchUp, Maya or C4D. Victor Voon, the renowned CAD teacher, presents an informative video focusing on realtime rendering method with V-ray for sketchup 64 bit application. He utilized CPU power with 1000M Gigabit Ethernet LAN to make this exclusive sketchup tutorial. Realtime rendering technology Demo with Vray for Sketchup 64bit. Spec: i7 k 2x using CPU power with 1000M Gigabit Ethernet LAN. This sketchup video shows how to obtain a superior indigo render for your Sketchup models. By watching this video one can learn how to solve overlap issue as well as attribute indigo renders to the existing materials, enlighten the lights of any model. In this video a sketchup car model is downloaded and rendered through iClone, an exclusive ray-traced renderer. 06:45 Renaming Materials and Assigning Shaders. 20:04 Saving Shader & Subdivision Values. 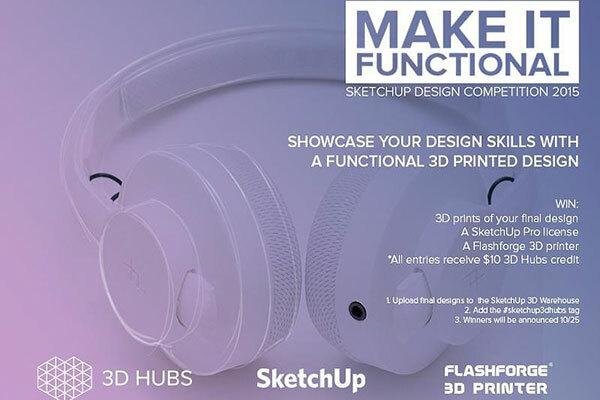 An exclusive sketchup design competition will be organized jointly by 3D Hubs, sketchup and Flashforge 3d printer. The participants have to present their design proficiency through a functional 3d printed design. How 3d printing can be used for generating end products like self-watering planters to headphones, desk organizers and lots other which are useful for your daily life. The motto is to incite both fresher and experienced SketchUp users to produce these functional designs. All the entries will be assessed by 3D Hubs, SketchUp and Flashforge on creativeness, practicality and printability concerning their application as day-to-day objects.